The Sun fell perpendicularly on the face of the Statue of King Ramses II in Abu Simbel Temple in Aswan on Saturday, 22nd February 2014. The unique astronomical phenomenon, which occurs twice a year, started at about 6:23 am and lasted for 20 minutes. The sun-struck event was seen by 5,000 tourists along with Social Solidarity Minister, Aswan Governor, 30 Ambassadors and representatives of the world media and press. The sun falling perpendicularly on Ramses II face at Abu Simbel Temple, a rare astronomical and engineering phenomenon, happens on February 22, the day he ascended to the throne and October 22, his birthday, every year. On these two days of the year, shafts of sunlight enter the temple and illuminate the statues of the great King Ramses II himself, and the two sun gods to which he dedicated the temple – Re-Horakhte and Amen-Re – but not touching Ptah, the god of darkness, who is seated next to them. The main temple was dedicated to Ramsis II and to the four universal gods Ptah, Re-Harakhte, Amun-Re, and to Ramsis II himself. 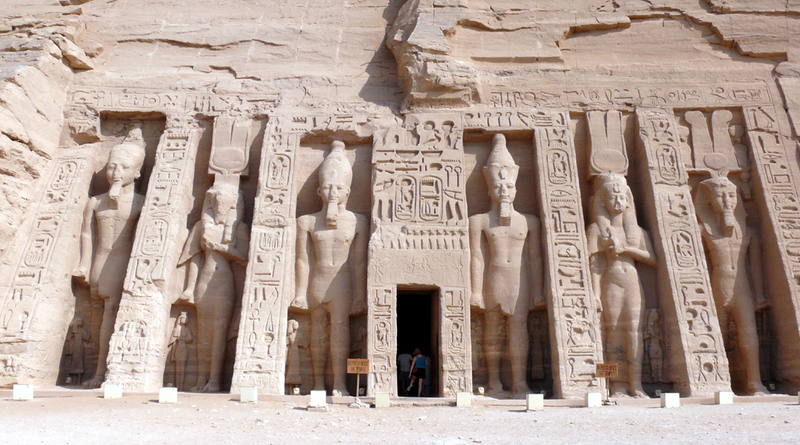 Of the seven temples he built, Abu Simbel is considered to be the most impressive. Above the doorway in a niche stands the sun god, a falcon headed representation of Ramsis, holding a war-scepter which shows the head and neck of an animal which is read as user, in his right and a figure of Ma’at in his left. This setup ingeniously creates the Kings Throne name of User-Ma’at-Re. At the top of the facade is a row of baboons which are thought to be greeting the morning sun and indeed the monument looks best at that time. The sides of the thrones next to the entrance are decorated with Nile gods symbolically uniting Egypt, while below are prisoners, representing conquered nations, to the left, African and to the right, Asian. The entrance leads into a Grand Hall which is 57 feet high and 52 feet wide and was cut from the rock. 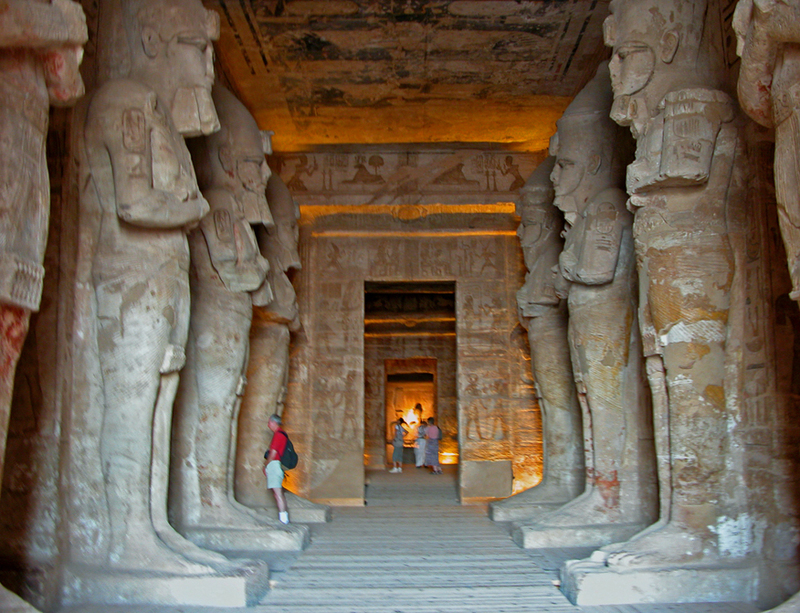 It is supported with eight pillars with statues of Ramsis. To either side of the Grand Hall are smaller rooms, two to the South and four to the North. Most suggest that these rooms were for storage (treasure rooms) but elsewhere it is suggested that they were used for festivals related to the Kings Jubilee. Beyond the Grand Hall is the second hypostyle hall with its flowered pillars. Scenes in this hall show the King and his wife, Nefertari making offerings to Amun and Re-Harakhte (the Sun God), and beyond that is the three chapels, the central one containing the four deities worshipped in the temple (including Ramsis II). Hathor was the wife of the Sun God so in a symbolic way, the two Temples, that of Ramsis II and that of Nefertari, brings Ramsis II and Nefertari and Hathor and the Sun God together as one. The facade of the temple is a receding Pylon, just as the larger temple of Ramesses II. On either side of the entrance to the temple is a deified statue of Nefertari with statues of Ramsis II on either side of her. The statues of Nefertari are the same height as those of Ramsis, which is unusual. Like at Ramsis II’s temple, there are children depicted around their feet. There are cobras protecting the Temple door. This temple is much simpler than the Temple of Re-Herakhte. It has only one hypostyle hall and the sanctuary. Within the hall are images of Ramsis in battle with Nefertari present. Other scenes depict Ramsis being crowned by Horus and Seith and presenting Ma’at to Amun. On the back wall, Nefertari is before Hathor and Mut. Just behind the Hypostyle Hall is a small chamber with images of Hathor cow framed in reeds. Beyond that is the sanctuary with a divine cow emerging from the rear rock wall protecting Ramsis, below her. Above the cow, vultures guard the Queens cartouches. Other scenes show Nefertari offering incense to Mut and Hathor, and the King worshipping before his own image and that of Nefertari.